Are you looking for effective relief for your Back pain, Sciatica, Neck pain, Cervicogenic Headaches or other Joint and Muscle Pains? If so, Winchester chiropractor Max Atkinson and Associates can help you. 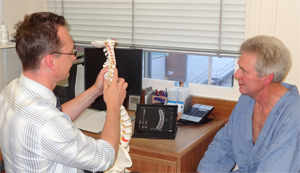 Bradford House Chiropractic Clinic has been helping the people of Winchester since 1989 and moved to its current site at St Clements Surgery in 1999, headed by owner and lead Max Atkinson. It is a family-orientated clinic in the heart of Winchester, Hampshire and also covers the Salisbury, Andover, Eastleigh, Romsey, Southampton and Petersfield areas. Here at the clinic we pride ourselves on being a very personable and friendly establishment where a first-class service in comfortable surroundings is all part of getting our patients back to health and fighting fit. Our team works hard to ensure that the entire process is as pain free and easy as possible so that our patients can fully focus on their recovery. One of the most inviting aspects is that the clinic is situated in a GP surgery and many of the doctors already recommend people to our chiropractors. Most of our patients come to us to help relieve their back pain, sciatica, neck, shoulder and arm pain, cervicogenic headaches, muscle or joint pain. All our Chiropractors are highly qualified with years of experience in their respective fields, are Members of the British Chiropractic Association and the Royal College of Chiropractors, and are fully registered with the General Chiropractic Council. Simply call 01962 861188 any day of the week and talk to our friendly reception staff for more information. If you are unsure whether Chiropractic is for you why not book in for a “FREE-SCREENING”. We offer these complimentary visits year round. You simply arrive, fill out a short questionnaire and then the Chiropractor talks to you about your concerns and may give you a brief examination. If we think we can help then we can book you in for a full assessment and start getting you better! If we feel that we can’t help we will do our very best to help direct you to someone that can or back to your GP or other health professional. We are often asked if we can only treat adults but the wonderful thing about chiropractic care is that it can help people of all ages and disciplines.